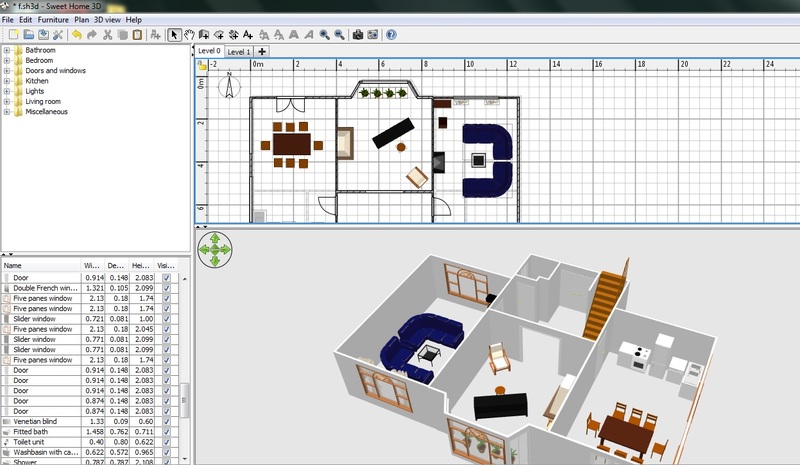 I'm in the mood for another free floor plan software review and this time I have a Sweethome3D review for you. Sweethome3D is totally free. There's no 'pro' upgrades to pay for and no products vying for your attention. It's the work of Emmanuel Puybaret who has made it available under the public GNU License so we can all use it for free. Merci Emmanuel! The application is available online and can be downloaded. You need to have your java installation bang up to date to use it online but it takes you through this installation if online is the way you want to go. I decided to download it. There's no tablet version available, but hey, we won't hold it against Sweethome3D. I'm sure Emmanuel would be delighted if someone out there with coding skills came to the party with an app version. 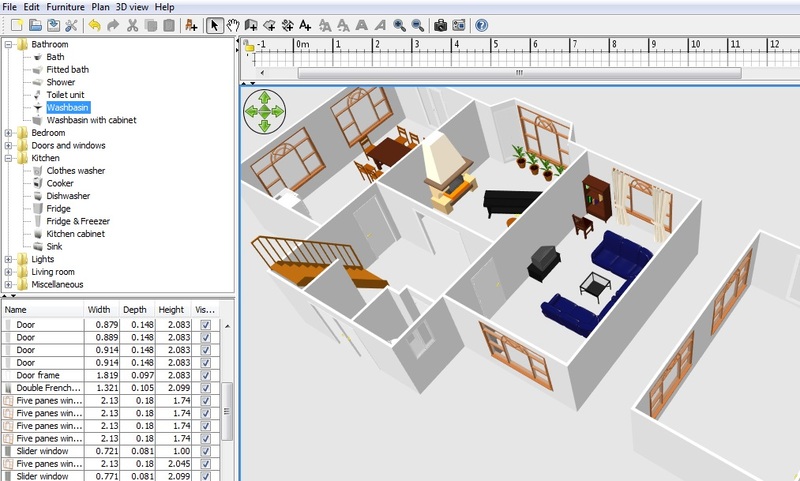 Sweethome3D is perhaps not quite so intuitive to use as the other free floor plan software applications I've reviewed, but it's by no means hard to use either. 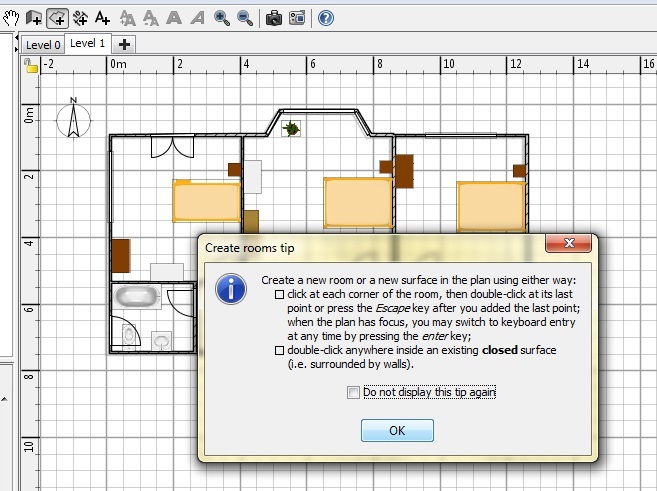 To make walls you need to click on the create walls button (on the top, tiny little button), or use the plan --> create walls menu sequence. Then you click at the start of the wall and double click at the end of the wall, or click and drag. The dimensions increment 5cm at a time. 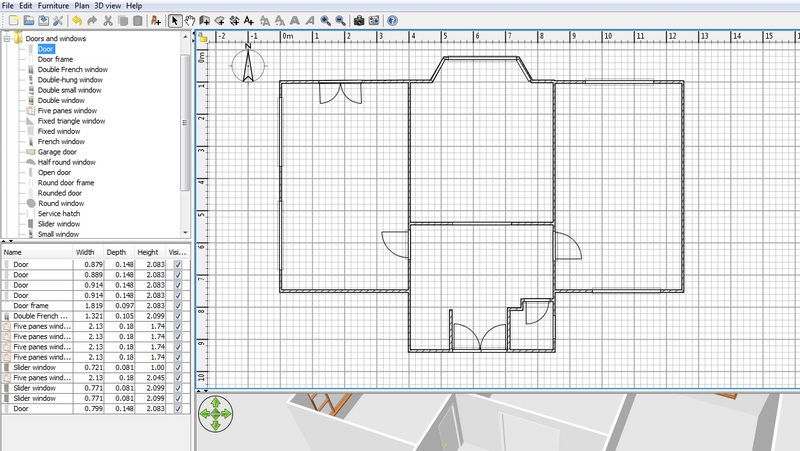 To enter dimensions, use the plan --> modify walls menu option then there's quite a few options for placing the wall on the page and entering an exact length. Angles are also shown while making tilted walls. You can change the unit using the File --> Preferences menu option. Next to the ‘create wall icon’, there is an option to include dimensions next to each wall; a useful feature. 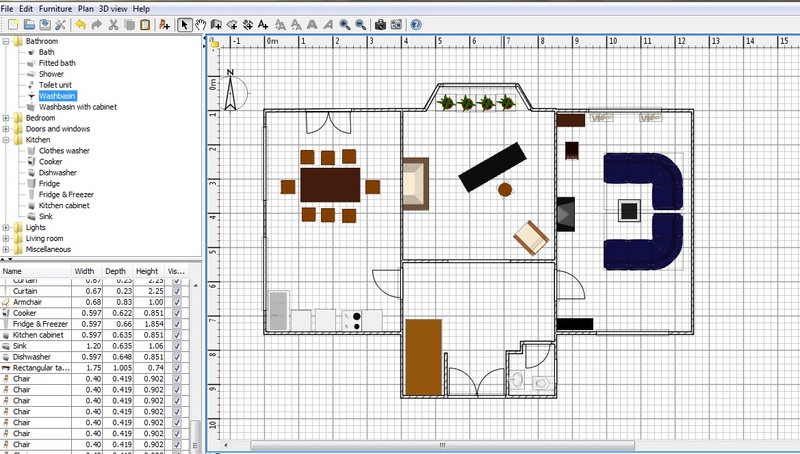 Another option is to draw rooms with the area space calculated. You can label your rooms as well! To clone a floor all you have to do is go to plan, and ‘add new level’. A new tab indicating the levels pops up. For example Level 0 means your ground floor. And level 1 means the first floor. What’s even better is that you can place your levels on top of each other and create a multistory house that can be seen in 3d view as well. To help you learn how to get the best out of Sweethome3D you'll be presented with a useful pop-up box every now and again with a helpful tip. You can make curved walls with Sweethome3D but it's not obvious how. Imagine the flat wall from where your curved wall extends from. Another left click when you've got the arc you want to lock it in. It took me a few gos at this to get used to it. If you want to create a circular room do two semi circles. 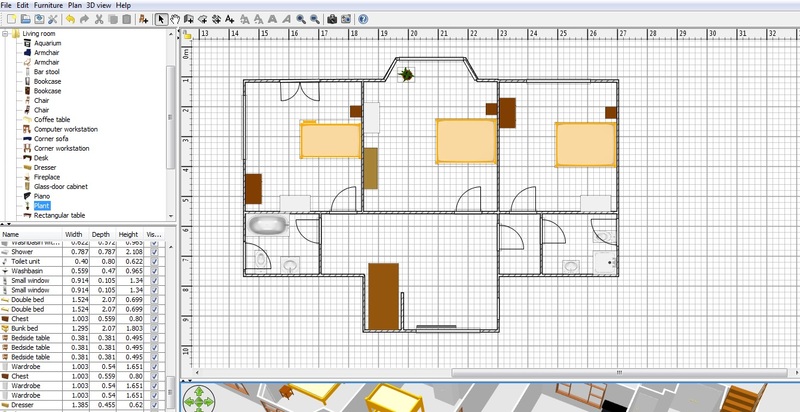 To add doors, windows and stairs, you simply have to go to each respective folder, click and drag, and then drop the item onto the floor plan. 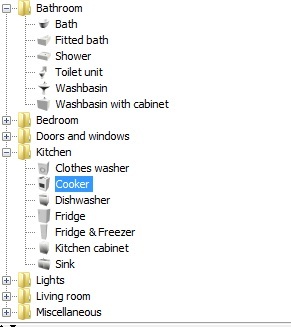 The company that made each furniture item can be seen if you hover your mouse over each individual item. I found the availability of types of doors and windows sort of limited. 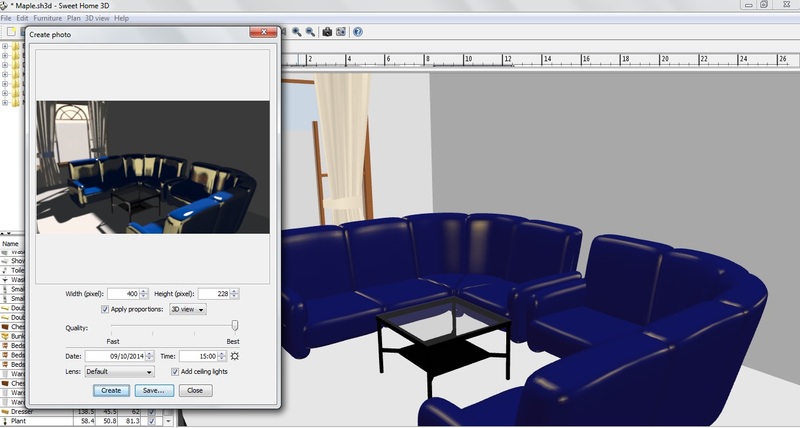 Good news though: you can import any furniture piece from the net if it is compatible with the application. It's easy to adjust the height of the doors and windows. 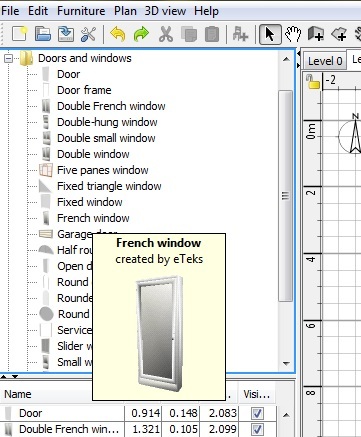 You can add doors, windows, furniture, plants, in fact anything in the formats that are compatible with the application (OBJ, DAE, KMZ, 3DS) I don't know what all of those are, but I do know that 3DS is compatible with Autodesk software and that KMZ is a Google format so we're dealing with common standards here. The image below shows an example of some of the libraries available. Adding furniture and changing the size is easy. You can change the size of things using that panel in the bottom left hand corner of the screen. The choice of furniture is pretty limited, but you will probably find what you need in the libraries. This is the most interesting feature of this software. 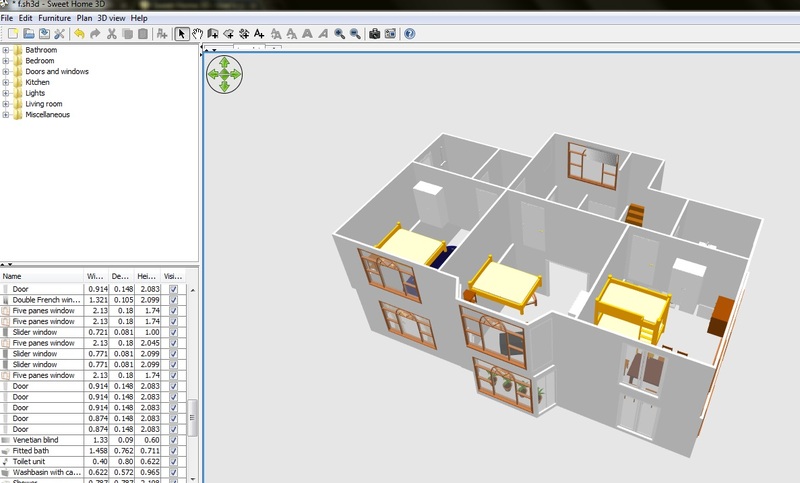 While creating your 2d plans, you can see your 3d floor plan being developed as well underneath in a new window. This really helped to get doors and windows right in place. 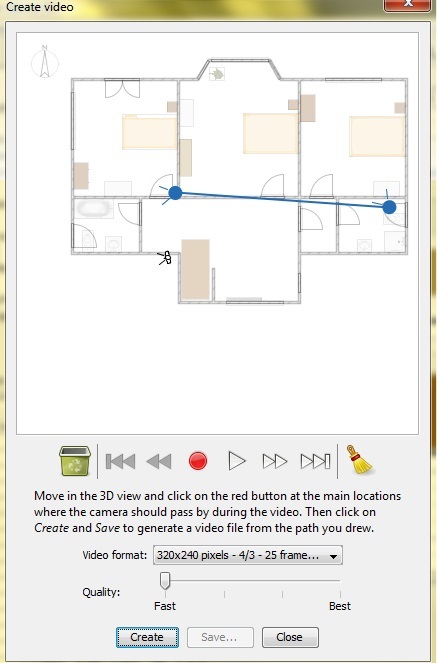 An option to take a snapshot of the 3d view is also available and so is creating a video of a walk through! You need to set up and pick up the points on the plan through which you want to create a video. I haven't got round to doing a You Tube channel yet so I've put the video up on Facebook. Here it is. 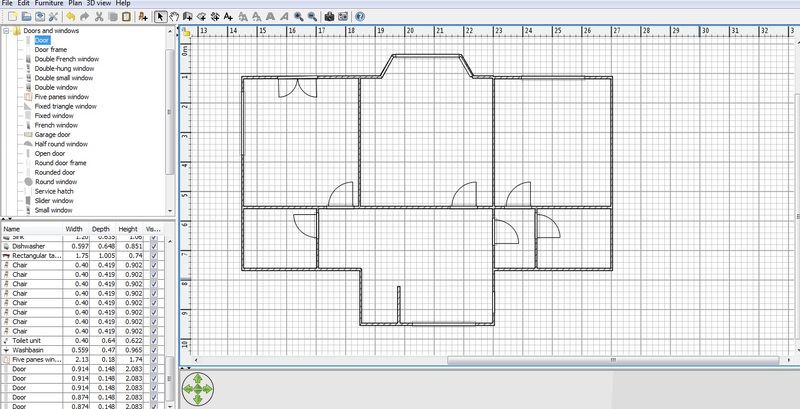 Post by House Plans Helper. There is also an option to take a virtual tour around the house and take snapshots as you move around. There's also a sunlight function to show you how the home will look at any particular type of day. First of all, make sure the compass is set correctly. You can rotate it round. Then open the 3D View --> Create Photo option. Move the slider to one of the right most quality settings (best, or the one just below) and the fields to enter details about what time of day you want to take a look at appear. Enter the details and click on Create. Saving is easy. 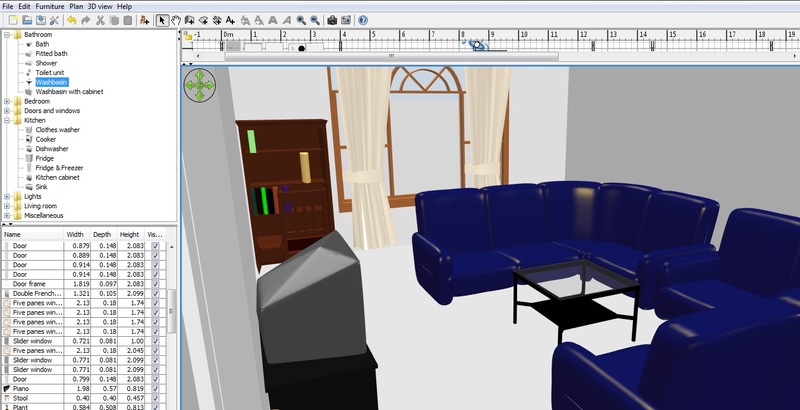 With the downloaded version files are saved in Sweethome3D format. The downloaded version doesn't have any built in features for sharing, but I managed it with the video - I just sent it myself on email and then posted on Facebook. You can import a background image to trace (or for any other purpose you fancy) by using the Plan --> Import Background Image menu option. Formats supported are BMP, GIF, JPG, PNG. Apart from saving in Sweethome3D format that we've covered another choice for exporting is to print to a pdf file, or save as an svg or obj file. The other thing you could do is to take a screen shot, then paste it into a basic graphics program and save as a jpg or png or whatever. To print it's good old File --> Print. 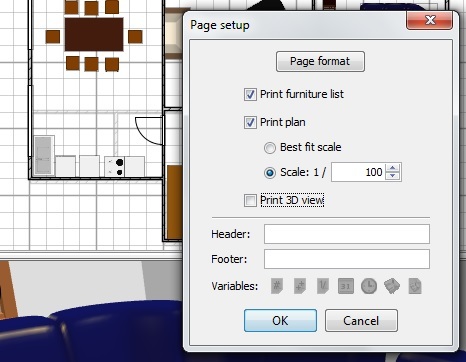 To print to scale use File --> Page Set Up. I hope this review will help you get started. When you get more into it, a proper guide on how to use this software is written on the website. If that doesn't cover it you can use the forums or you can contact the help team directly through email. Let's finish with a bit of a recap of this Sweethome3D review. It's freeware so go ahead and program your own! I'm going to give it a yes here. It's slightly less intuitive than other applications but with the tips and knowledge of programs like PowerPoint it's pretty easy to get to grips with. Not only a 3D view but a 3D room photos and 3D walk through as well! Yes - bmp, jpg, gif, png supported. Print both 2D and 3D views. Not really. It's Sweethome3D format, or export to a pdf. No easy peasy sharing available. Good manual supported by forums and help email. What do you think of SweetHome3D? I'd love to hear about your experiences using this software.